Bike Rings at Sunset. Photo by Alison Mara of True North My awesome helpers and I have been busy knitting and crocheting for Round Two of the Yonkers Yarn Bomb. I’ve received some great coverage and even my first TV interview! The completed woven American flag. Photo by Sarah Divi. While I finish sewing squares into fish for this Saturday’s installation, check out what people are posting about the yarn bomb: News12 Clip (and my first TV interview! ), Fios News Coverage – Featuring Mayor Mike Spano, and Yarn Bombing Hits Downtown Yonkers article. Behind the camera. Photo by katelohenry. Flag weaving in progress. Photo by katelohenry. Celebratory high-five! Photo by Alexandra Vaccaro. Photos and collage by Alexandra Vaccaro. Flag and Shadow. Photo by Sarah Divi. 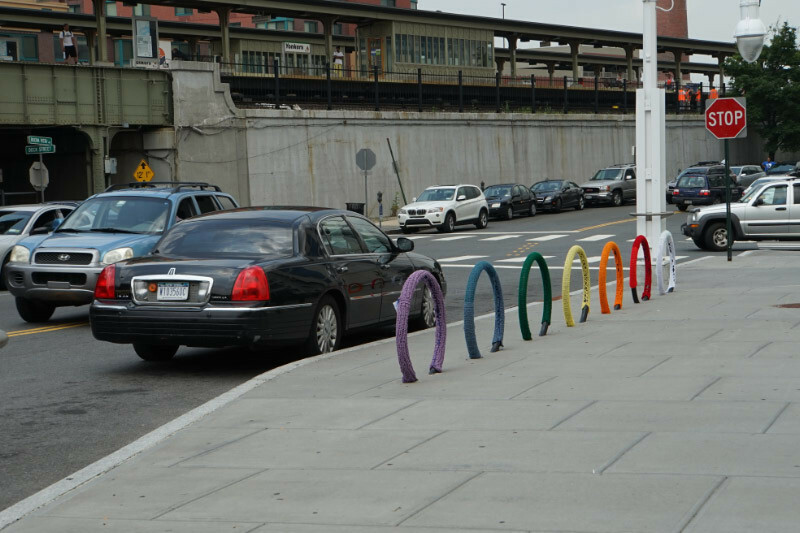 Yarn bombed bike rings. Photographer unknown. 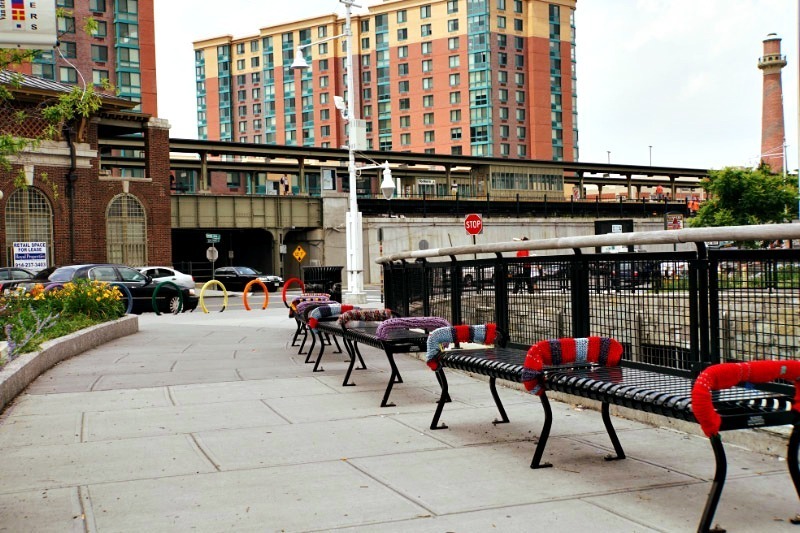 Yarn bombed benches and bike rings. Photographer unknown. Do you have any pictures of the yarn bomb at Van Der Donck Park? If so, please send them to me, I’d love to share them. Come out and cheer us on this Saturday from 1 – 4 PM as we install the last round of the yarn bomb!